Foodies love nothing more than a new restaurant opening in town, but for me this was even more exciting as it was Mediterranean themed! Papa Ganouj just opened its doors in the heart of the Pearl District and it is already serving up a crowd of happy customers. The menu is colorful and unique with dishes ranging from the classics to items like the Moroccan inspired “mezze”, figs and dates. My table of foodies included restaurant owners, food bloggers and chefs but I knew they couldn’t be nearly as eager as I was for this fare. In one glance I already saw dishes my mother had prepared for me as a child and I had never before seen on a Tulsa menu. Maybe I have found my new home. Mezze is something I wish was more appreciated in the States. 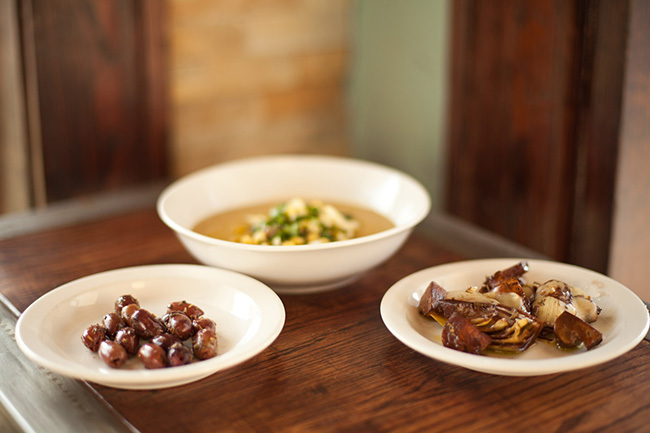 Tapas sized dishes to accompany your drink (or drinks!). 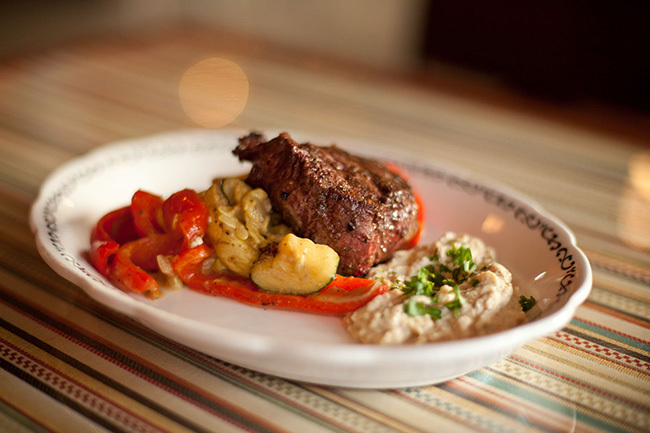 Papa Ganouj offers a distinctive variety such as house made hummus, tabbouleh and of course the baba ganouj. My favorite however, was their marinated artichoke and mushrooms. Tender pieces or artichoke and mushrooms in a delectable, bright dressing of eastern spices, garlic and lemon. Others that stood out for me were the torshi, a zesty combination of spicy pickled veggies as well as the olives, a mix of high quality, Greek imported kalamata olives in olive oil and herbs. I wanted everything on that menu believe me, but what got my attention the most was the moussaka lasagna. Moussaka is my comfort food that I never thought I would find at a restaurant, but here it was! There are many variations of this dish. The Greeks base it on eggplant and peppers while in Turkey they serve it on a bed of pilaf with yogurt sauce. Bulgarians are used to it with minced beef, a potato base and a layer of egg and yogurt baked to a crust. But, Chef Wilson served me up an alternative lasagna fusion that I had never had before! His take is a vegetarian’s delight. 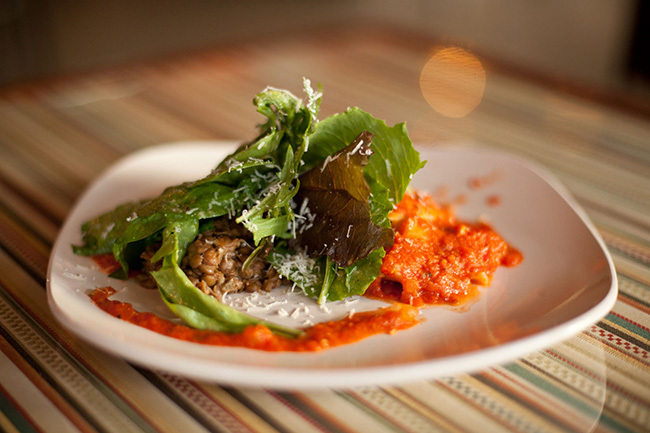 House made pasta layered with hearty eggplant and squash, accented with tomato and garlic. In addition to that, the plate also came with mjadara, well-seasoned simmered lentils and greens. This plate was filled with flavor because of its numerous and fresh ingredients. 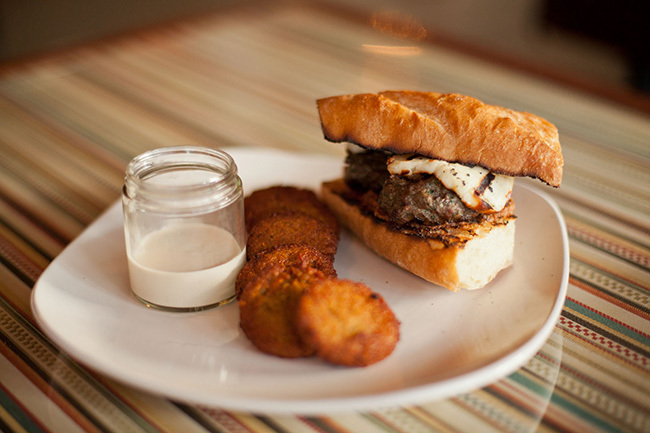 Another must try on the menu is the Kafta burger. Tulsa has so many burger options, but I am in love with the one Chef Wilson offered us. The bun is replaced with French bread, freshly baked everyday at Antoinette’s, which is soft and gooey with the meat’s juices on the inside, but has the kind of crust it takes to handle it and keep the sandwich in one delicious piece. It includes a Mediterranean relish, a tahini spread, and a side of house made falafel and yogurt sauce to dip it all in! If you love your burger but want to try a totally different Eastern variation of it, this is my new go to. The meat lover will find many options on the menu from a unique Zatar Filet served with hericot vert: a variation of string beans and spiced mash to the Bourguignon, lamb braised in its own juices and white wine, plated over couscous and crispy greens. One that really stood out for me was the Shawarma, a combination of beef and lamb that is just perfection. Tender pieces of grilled meat of the gyro sorts but made in house with the best cuts of meat with flavor that speaks for itself. Colorful grilled veggies, tabbouleh and pita accompany this dish. 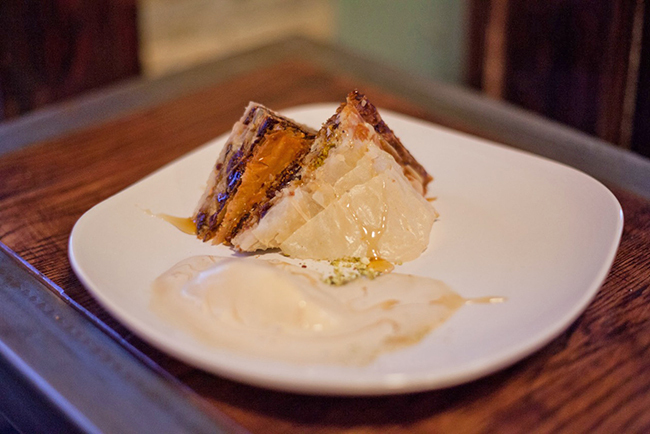 Finally for dessert, Chef Wilson has a thing for homemade ice cream and it did not disappoint. The dessert we had was the baklava which was paired with an absolutely delicious and inimitable molasses and pomegranate ice cream. Sweet but tart, it was something I’ll never forget (word is this has changed to equally delicious date ice cream now). The baklava was nothing like the stale little squares you might have seen around town. This–you immediately could tell–was handmade and the portion was big enough to share with your date, or in our case, the whole table! Margaret Vasileva was in born in Sofia Bulgaria, a beautiful country nestled in Eastern Europe right above Turkey and Greece. Her heritage has left her with a passion for authentic and colorful foods as well as an obsession for fresh produce. "I can spend an hour picking just the right tomatoes for my evening salad, and I really mean an hour! Good food is all about the ingredients. Europeans have always known this, and I am glad to finally see this trend coming to the United States." From the endless produce markets of Bulgaria to the "Wild West", at first the move to Oklahoma eleven years ago was a difficult one, but now as a staff writer for TulsaFood she is out to showcase how diverse the Oklahoma cuisine scene has become!